Areas in Phase 1: Main terminal building of 1.4m square metres, two runways, Airport Traffic Control Tower and auxiliary buildings. Number of Passenger Boarding Bridges: 143, with 15 for Airbus A380s. 257 spaces for remote parking. Baggage system: 42km long, which can process 30,000 bags per hour. 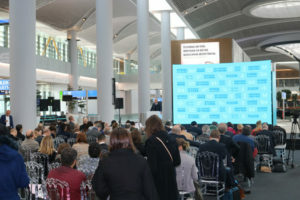 Istanbul New Airport has been unveiled to the world’s media, with Travel Extra representing Ireland at a sneak preview hosted by airport operator iGA days before it hosts its first passengers. The airport, with capacity for 90m passengers a year in the first phase of its construction, will have a soft opening at the end of October, with Turkish Airlines operating a limited number of domestic and short international flights. The old Ataturk Airport – used by Turkish Airlines on Dublin flights at present – will continue to operate until the end of December, when all operations switch to the new, as yet unnamed, airport. He said that the airport will hope to attract airlines – including low-cost carriers – who turned away from Istanbul because of capacity issues. But the airport will be dominated by Turkish Airlines, with Mr Samsunlu saying: “the main player here is Turkish Airlines who have very serious plans” for future growth. Scale: Put simply, the airport is enormous. Phase 1 alone is 41.5m sq m, rising to 76m when all five phases are completed. It dwarfs Ataturk (12m sq m); Atlanta (19m); Beijing (23m), Heathrow (12m); and Frankfurt (21m). Its terminal floor area is five times the size of that of the Empire State Building, its buildings feature 80 times more steel than the Eiffel Tower; and its terminal roof is 23 times the area of Rome’s Coliseum. Technology: Kadri Samsunlu said the airport will be the first in Europe to feature end-around taxiways, where aircraft can taxi around active runways, speeding up movements. He said the luggage carousel system – featuring new barcode technology to speed up deliveries – will be the biggest of its kind in the world. It can also hold 10,800 pieces of luggage loading from transiting passengers. Aircraft will also be guided to their terminal bridges using real-time camera technology from a control room. To keep security tight, the airport will feature 9,000 CCTV cameras in the terminals. “A cosmopolitan city like Istambul has 22,000,” said Mr Samsunlu, so it’s around 40pc of what that has. The airport will also feature driverless cars, which are being tested at the moment, along with a police robot to videotape the terminals and other robots to clean the terminals, or guide passengers to their gates or give information, said Chief Information Officer Ersin Inankul, who heads up the technology side of the airport. “If you download the iGA app, we can follow you from door to gate,” the CEO added, so passengers can be directed as the app knows where they are in the airport, using homing beacons. If you are parking a car, it can also be traced using the smart car feature on the app, Handy as the airport will have Europe’s largest car park, with 40,000 spaces, compared to 15,000 in Munich Airport and 2,600 at Dubai. Getting there: The dedicated metro rail link won’t be in place until 2020, but a fleet of 150 buses was announced at the press conference, which will link the airport to existing train stations. The new Northern Marmara highway will get passengers from the city centre to the airport (35km) in half an hour, compared to commutes of up to two hours on the crowded E5 which serves Ataturk now. For now, only phase 1A of the project (costing $7.5bn) was open to journalists, and even the airport CEO revealed that he does not know the official name of the airport yet, but that is expected to happen at the end of October.